Low Level Laser therapy is a natural, non-invasive treatment that feeds the cells of the body an energy source in the form of light(photons). Also called 3LT, laser therapy has been popular in Russia and Europe for three to four decades. Scientific studies have shown that cells respond to a certain wavelength of light (635nm,ruby red), at a certain very low power (5 microvolts). This improves cell functions such as erergy production(ATP levels) and cellular communication, two vital factors in the healing process. Medical lasers that cut and cauterize are very high powered (300 volts). These hot lasers are useful in surgeries and other medical treatments but are entirely different from our cold laser. Our cold laser is the Erchonia pl5000 and is FDA approved for treatment of back and shoulder pain, as well as improving range of motion. In addition the Erchonia laser also recieved FDA approval for burn healing. This is a wonderful tool to accelerate healing of damaged or less than ideally functioning body tissue. When used in an applied neurology/chiropractic protocol, the results have been very exciting. Many injuries and funional problems can be successfully treated with this new and innovative technology. Mesa, AZ, May 17, 2004, - For about a year I have been taking classes in how to use the Erchonia PL5 low emission cold laser and experimenting with it in my practice. The results I am seeing are intriguing, arresting, and many times downright amazing. Later on in this report I will do my best to briefly explain the science behind low emission laser therapy and why it works. But first I want to share with you some of its applications and the kind of results I am seeing with my clients. Founded in 1996 to advance the art and science of health through the development, and distribution of superior Erchonia® 3LT lasers. Erchonia is dedicated to the highest quality standards, evidenced by their ISO 9000 and ISO 13000 manufacturing standards. They have built an impeccable reputation in the sports market, working with several professional organizations such as the New York Jets, Kansas City Chiefs, Philadelphia 76ers and the Milwaukee Brewers to name a few. Erchonia's manufacturing facility is located at 4751 E. Indigo Street, Mesa, AZ 85205. All parts of the Erchonia® 3LT Laser are made in the USA. For more information on Erchonia, please visit their web site at www.erchonia.com. In every medical tradition before ours, healing was accomplished by moving energy. Light energy has been used for healing since the earliest recorded medical history, but has gone out of favor in Western medicine with the advent of the existing paradigm of a more surgical and pharmacological basis. Recently, a shift in thinking has been emerging with an explosion of research, exploration and utilization of energy medicine modalities such as micro-current stimulators, bone growth stimulators, broad-spectrum multiple frequency Tesla coil devices, and low-level or cold lasers. Despite years of research demonstrating the benefits of low-level laser therapy (LLLT) as a modality for wound healing, Western medicine, and its adjunct professions, have been slow to adopt this technology. LLLT has been an essential part of therapy for practitioners around the world for almost 20 years, but it is only recently catching on in the United States. Still, the vast majority of students of medicine and allied health practices in this country are not being taught its efficacy and use. It's time we opened our eyes to the light. One of my first eye-opening experiences with LLLT in wound recovery was with a burn patient. As a plastic surgeon and medical director of a burn and wound center, I see large numbers of acute and chronic burn injuries as well as wounds of various etiologies. One particular gentleman had a home fire that melted his carpet and he was forced to walk across it in bare feet to get out of his home. He presented with very deep foot burns and severe pain. He was on chronic narcotics due to an old back injury, so I knew his pain would be difficult to manage. At presentation his pain was exceptionally severe and the bottoms of his feet were purple, swollen and sloughing skin. Within two minutes of treatment with the 635nm Erchonia® cold-diode laser his pain decreased by a self-reported 75%, and his skin went from blue and purple to pink right before our eyes! As you can imagine, our jaws dropped and this particular laser therapy has been a part of my practice ever since. The exact mechanism of action of LLLT is not completely understood; however, there are several theories based on cellular research conducted over the last two decades or more. The basic premise is that LLLT stimulates cell activation processes which, in turn, intensify physiologic activity. Healing is essentially a cellular process and light energy initiates a cascade of reactions, from the cell membrane to the cytoplasm, to the nucleus and DNA. This is called cellular amplification; a phenomenon whose demonstration earned the Nobel Prize in Physiology or Medicine in 1994. There are many biological processes that take place in tissues that have been shown to respond to LLLT in the 630-640 nanometer wavelength range. One of these processes is the enhancement of ATP production in the mitochondria, which provides more energy substrate for cellular healing and tissue recovery post injury. This wavelength has also been shown to decrease inflammatory mediators in wounds and increase endogenous endorphin release. When one considers that wounds have varying degrees of cellular and vascular damage, the wound site can be in a potentially anaerobic state. Cells deprived of oxygen or blood supply have a potential to increase lactic acidosis and therefore amplify local cellular damage. Normal physiologic healing requires growth factors and cytokines to be released at the wound site. These cell mediators call inflammatory cells to the wound which clean up damaged tissues, fight bacteria, and stimulate fibroblasts and vascular cells to grow to try to heal the zone of injury. The physiologic concept is that LLLT improves cellular metabolism and accelerates the process of debris cleaning, improves neutrophil bacterial clearing and hastens cellular division. Therefore, all stages of wound healing; hemostasis, inflammation, cell proliferation and migration, collagen synthesis, wound contraction, and wound remodeling proceed more rapidly and more efficiently. A key issue to understand is that LLLT, as a category, covers a broad range of wavelengths. Individual wavelengths have individual physiologic results. The 635 nm wavelength is the monochromatic output that has been shown to be the best wavelength for improving cellular metabolism and therefore, improving wound healing. Another important property of an effective laser is that it be a true laser, which, by definition, produces the emission of coherent light, generated at a precise, stable frequency, in a focused direction. Products that use Light Emitting Diodes (LEDs) are not true lasers. They produce non-coherent or random light, generating random frequencies. Coherent light energy is critical when treating the human body. One more consideration is the optimum power necessary for bio-stimulation. The Arndt-Schulz Law of photo-biological activity, essentially states that "less is more" when it comes to energy for improved cellular physiology. The Erchonia® LLLT provides the best wavelength (635 nm) for cellular physiology at very low energy (2-5 mill Watts) to stimulate cells to function better. If the stimulation is too intense, there may actually be an inhibitory effect, or possibly degeneration or destruction of cells. Our research with burn patients demonstrates several advantages to the 635nm LLLT in burn/wound management. The most immediate advantage is an average of 70% decrease in pain at the wound site within 5 minutes of a two-minute treatment per 4% total body surface area (TBSA). Other research has shown that LLLT increases natural endorphins in patients. This increase in endorphin release would explain why we often see decreased pain for days at a time. I believe we are also seeing an immediate decrease in sensory nerve stimulation and a decrease in sympathetic stimulation. This decrease in sympathetic tone and sensory nerve stimulation provides the decrease in pain within minutes. During our studies with burn patients we noticed that they had less swelling in their wounds, visibly improved perfusion (blood supply) to the tissues and faster healing. When patients have continued LLLT and we follow them post-healing, they have less scar formation and less purritus (itching) in their scars. Currently, we are undertaking a multi-center, double-blinded trial that will explore the potential of LLLT in healing burn injuries and decreasing their late complications. Our success with the burn-injured patient led us to apply LLLT to the management of other complex wounds. Some of the wounds we have treated include diabetic wounds, decubitus ulcers, post-orthopedic surgery wounds and skin and myocutaneous flaps. We use the laser to decrease inflammation, improve tissue perfusion and decrease pain at the wound site; each a tremendous advantage to the patient and the treating practitioner. The Erchonia® laser's first FDA approval was obtained for the management of neck and back pain. The advantages in improving musculoskeletal pain carry over to the physical therapy and occupational therapy arenas. We have found in our clinical work that patient's stiffness and sense of tissue tightness greatly decreases after LLLT treatments. Typically, an improvement of 30-50% occurs with just one treatment. Many extremity wounds have long periods of immobilization associated with them; from splinting, surgery, or just a protective mechanism of pain control. LLLT treatments increase the patient's recovery of range of motion (ROM). This mechanism of improved ROM is separate from pain control and protective issues. Later, after a burn or wound injury, many patients will report no pain, but have problems with tightness and stiffness. Within minutes or hours of LLLT treatments they report significant (>30%) improvement in the tightness. We have also found that many patients may have a functionally normal ROM by goniometer measurements, yet feel very tight or stiff. The LLLT greatly improves their subjective assessment of tightness, however their ROM may remain the same. 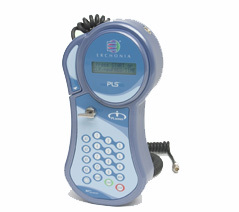 The Erchonia® laser is a very portable, user-friendly, hand-held unit. Treatments take about 5 minutes total on average, so it fits easily into a clinical treatment schedule. Erchonia® laser can be used with full contact with the patient if needed, but most treatments are done about 6-12 inches away from the surface area so there is no cross-contamination if the patients' wound is colonized with resistant bacteria. LLLT can be used in the setting of open wounds, burns, tissue injury, surgical recovery, neuropathy, deep tissue injury or active infection. There is no known "tissue problem" that is a contraindication; however, I would not suggest treatment of a known active cancer until more studies are done specifically in cancer cells. To date, there is no evidence that LLLT converts normal cells to cancer cells. LLLT can be used near and over hardware such as artificial joints. Pregnancy is not a contraindication, but it is suggested that a pregnant patient not be treated due to medical/legal issues. Though there are no known problems with the use of LLLT on a patient with a pacemaker, it is not suggested that it be used directly over the pacemaker or pacemaker wires. LLLT can be applied through dressings and clothing, though, in my practice, I like to observe the areas when treated. In the physical therapy setting this is important because dressings or garments don't always have to be removed. The number of treatments depends on the problem being addressed and may be as little as one and as many as 20 spread over several months. There can often be increased exudate in an open wound for LLLT increases tissue perfusion which can increase wound fluid. Pain at the treatment site is rare, but can occur on occasion with a mild increase in pain that then significantly resolves in 1-2 hours. As a plastic surgeon in charge of a burn and wound center for many years, I have had the opportunity to assist multiple patients with pain management, wound healing and physical recovery with the use of 635 nm LLLT. This modality has been the best new technology I have had to offer my patients in the last decade. It is my hope that others will latch onto this technology and bring it forward, for it is a completely non-invasive option that provides so many physiologic advantages with no apparent side effects. Dr. Jeffrey Nelson is a plastic surgeon who has been involved in wound healing for more than 20 years and is currently the Medical Director of the burn and wound center at St. Mary's Hospital in Tucson, Arizona. Karen Nelson has an advanced degree in physiology and is working as a medical writer in Tucson, Arizona. "If a writer is so cautious that he never writes anything that can be criticized, he will never write anything that can be read. If you want to help other people you have got to make up your mind to write things that some men will condemn." Thomas Merion, "Seed of Contemplation"
1 Ling G. Life at the Cell and Below - Cell Level. New York, NY: Pacific Press; 2001:234-246. 2 Oschman J. Energy Medicine. London, England: Churchhill Livingstone; 2000:130. 3 Turner J. Hode L. Laser Therapy. Grangesberg, Sweden: Prima Books; 2002:362.